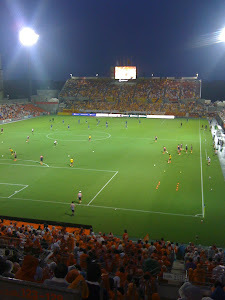 On Wednesday June 27th Ardija headed to Nigata to play Albirex in an evening game which beforehand was about as meaningless as any game could get. Both teams were out of the competition, and therefore Verdenik quite rightly chose to play around with the formation. Something I'm not sure Jun Suzuki would have done, but that's a little unfair to say I know. The new man's changes, most noteably keeper Keiki Shimizu and forward Shintaro Shimizu, would have a large part to play in affairs and as it turned out the fans who turned up that night at the Big Swan stadium were in for a goal feast. 2-0 up half time through goals from Shintaro Shimizu and Daigo Watanabe, Ardija would make it 3 through another strike from Shimizu after 48 minutes and the Squirrels were flying. However just as Ardija fans started to relax and think about the fine prospect we have in Shintaro Shimizu, the defence slowly started to unravel itself and Nigata pulled goals back through Kogure and Hirai. As the game entered its dying moments the Ardija defence eventually crumbled and died, and let Suzuki in for 2 late late goals and the game was lost. The defensive implosion started with the introduction of young South Korean defender Kim and it would appear that Verdenik had seen enough of him as he would soon leave the team to play in China for Guangzhou Evergrande. Although defensively the second half has to go down as a terrible performance, it was a game where the result did not matter as much as what the new man in charge could learn from it. In the weeks to come, in the important battles that lie ahead, we will see if Mr Verdenik learnt much from this loss and how he put those lessons to use.